Our next meeting will not be on the first Monday of the month as that is Early May Bank holiday. So we will be meeting on the following Monday 13th May. 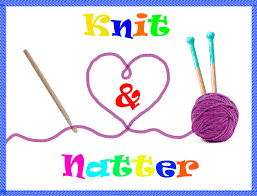 As we have not had a Knit and Natter for a while we thought we would have one for our April meeting. So please bring your hand yarncraft work in progress for a relaxed meeting. As usual we will also have our 'Show and Tell' as we all love to see what different people have recently made. We expect to have the new (to us) knitting machine cabinet delivered and set up with the club knitting machine so we can also spend time with individual knitting queries and concerns. Finally we would like to do a little planning and consultation for our programme for the rest of the year, so please put your thinking caps on and maybe come with a few ideas.